Our Golf Majors pools are back for 2019! The Masters starts Thursday, April 11th. Sit back and enjoy your pool! Take a test drive on us with no commitment. No more collecting pick sheets. Members use our online, bullet-proof pick sheets. Pick sheets are locked down when your event begins. Running your NFL pool has never been so easy! Regular season and Playoff formats available. 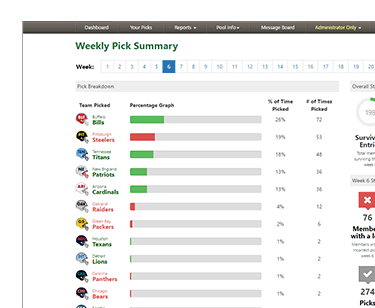 Choose from 8 different NFL football pool formats, which can be started at any point during the season. We offer 4 different formats for the Men's NCAA Basketball Tournament. Configurable scoring options are available. We've got your Golf pool covered from tee to green! 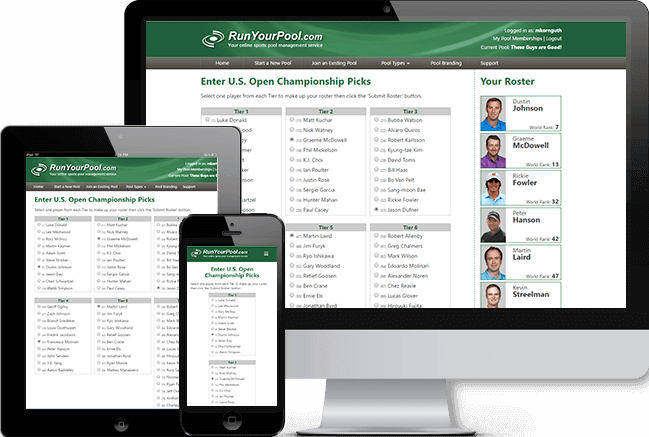 Multiple pool formats with many pick and scoring options. Whether you want to run a pool for the Majors or a weekly fantasy pool, we have a format that will meet your needs. You can start a new pool at any time during the season! While America's past time isn't traditionally associated with office pools, we currently offers four great baseball pool formats to choose from. We'll lighten your workload and help you enjoy Bowl Season. Run your Stanley Cup Playoff Bracket pool online this year. Our customizable scoring system allows for flexibility for the Pool Administrator. From group play to the knockout stage, we make it easy to run your Football (American Soccer) pool! Run your World Cup or Euro Championship pool with us! Run it for friends & family, your office, or your clients. One of the most watched television events of the year. Create a roster of countries you think will have the best medal count. We've run both a March Madness and a Pro Football Pool through RunYourPool.com. It's easy to set-up and easy for the players to use (with over 1000 players, that was very important to us). But what I was most impressed with compared to other sites we have used, is the quick response we received if we had any questions or concerns. Top notch service. —Panama Jack, Program Director, WGLX Radio, Wisconsin Rapids, WI. The amount of time I saved using RunYourPool.com made the service worth every penny. I ran my NCAA basketball pool and my NFL pool with RunYourPool.com this year, and both went off without a hitch ... something that's never happened before! Great customer service, too. I would highly recommend RunYourPool.com to anyone who is tired of running their pool by hand. I have run my football pool for years for my husband and friends. What a headache it has been until now. Thanks for a great service! What a great experience. Saved me hours of work in Excel. Thanks! This is a great marketing tool for those of us that want a lot of people playing. The staff at RunYourPool is great to work with and receptive of feedback.